If you want to get away from it all overnight, seek out riverside roads that are closed to cars but open to bikes, and get yourself a sturdy bike and trailer. Sharing the outdoors with my 3-year old son has been one of my greatest joys as a father. Ian has been camping with us since he was just 2 weeks old and he’s continued to love sleeping outside as he’s grown older. But as he has gotten bigger (and heavier) we’ve reached the point where backpacking just isn’t an option for our family. He’s too heavy to carry. Necessity is the mother of invention, and last summer my wife, Amanda, and I started brainstorming ways we could achieve some of the upsides of backpacking and still bring our toddler with us. One solution was to try a form of camping we had never considered before: bikepacking. Basically, we would take what we needed for a typical backpacking trip, plus a squirming little boy, and haul everything for an overnight trip on mountain bikes. The perfect campsite, it turned out, was waiting by a river in an abandoned campground near a washed out mountain road. And the experience was all I needed to become a believer that bikepacking could tide us over until Ian is old enough to hike with his own gear. We’re not advanced bikers by any stretch of the imagination. My mountain bike is a clunky relic from the 1990s and my wife’s bike is more of a cruiser designed for paved roads. 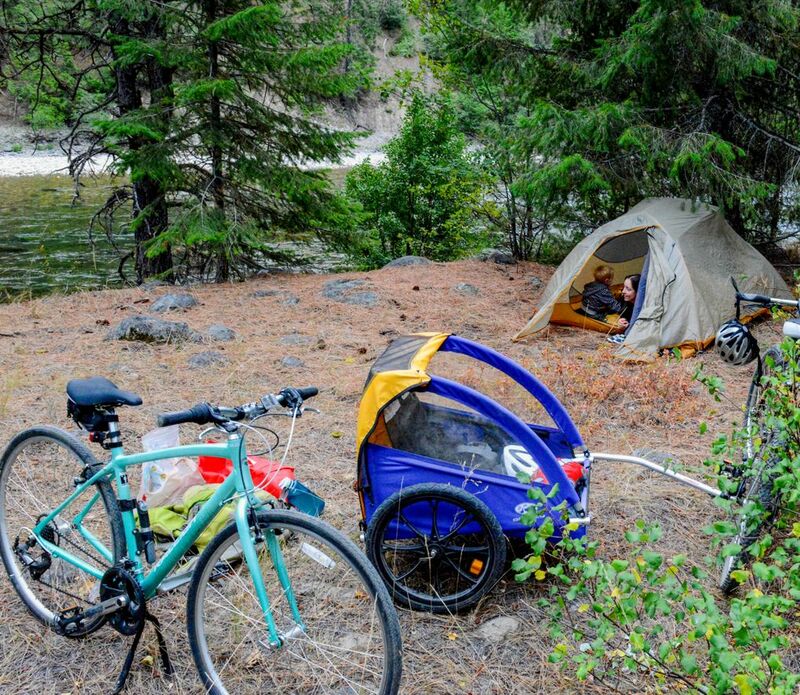 While many bike campers use an assortment of racks, saddlebags and panniers to hold gear, we simply used a bike trailer that we found on Craigslist. These trailers are popular even for those bikepacking without kids. On our first outing, we put Ian into his seat and began loading sleeping bags, food and clothes around him. I was surprised at how much gear our little trailer would hold. With a bit of help from some cargo straps, it soon gobbled up almost everything from my pack, and about half of what Amanda usually carries. Sure, our son was a bit cramped, but he had the easy job of kicking back and enjoying the ride. 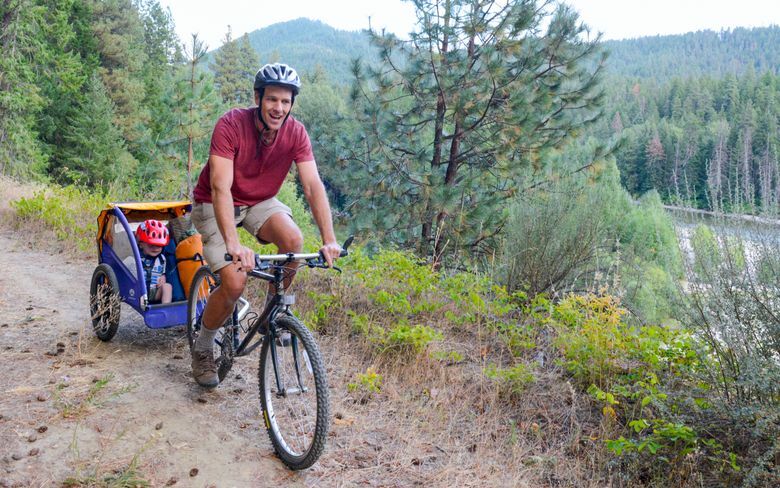 Experienced bike campers with kids say you can expect to tow about 100 pounds, so you’ll need a sturdy bike that can handle that kind of stress. Many online resources point bikepackers to state parks with ample campsites and roads where drivers are accustomed to bikers. But we wanted more solitude and decided to look for areas that would be free of cars. Fortunately the Forest Service was kind enough to provide a perfect trail for us in the form of a closed road. Every winter, storms ravage Forest Service roads, causing washouts and slides and knocking over trees that block access to vehicles. These roads are frequently left closed for a season or more as agencies wait for repairs. For bikepackers it’s the chance to turn lemons into lemonade. A quick online search turned up a promising option in Eastern Washington that normally fed several campgrounds. We drove to the closure and checked the signs carefully to be sure we weren’t putting ourselves in harm’s way. Sure enough, it was still open to people, horses and bikes. With a sluggish trailer behind me, we knew we couldn’t travel up anything steep or bomb down single track. We needed a wide trail with a gentle grade, and the slow gradual incline was perfect for traveling, except for the occasional loose cobble and sand. After a few minutes, we reached the cause of the closure. A washout carved a hole in the road that was too big for cars to safely pass, but our bikes could cruise around the hole without issue. A short while later, we encountered a large downed evergreen spanning the road. Normally this would call for some chain-saw work, but we simply maneuvered our bikes under it. In a pinch our trailer can detach in seconds, and we can carry our gear across obstacles — much like the way you portage a canoe. But most of the time, two people can lift bike and trailer together. Since that first trip, we’ve tried steeper terrain, but have learned that roads following rivers or former railroad lines offer a nice consistent grade. It doesn’t take much to keep a toddler entertained in nature. All they need are a few rocks and some water. Typically, a mile or two of travel is all we need before promising campsites materialize on riverbanks. Another upside: If we have serious mechanical issues, we can just walk our bikes out. After an hour or two of sweaty biking, Ian is usually ready to get out and play, so we find a nice secluded spot and spend the rest of the day splashing in a river, climbing the boulders like lizards and spying on the creatures that wander through our camp. Best of all, when our toddler pitches a screaming fit in the middle of the night, there’s nobody around to care. The only apologies we have to make the next morning are to the birds and squirrels. Roads are often closed for good reason. 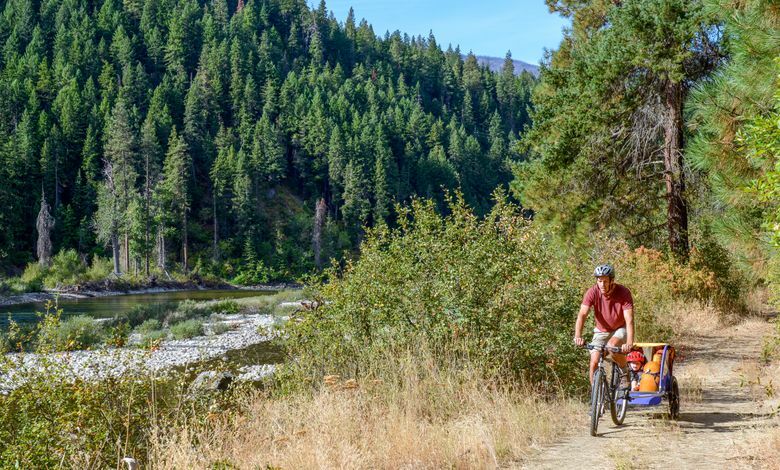 Before setting out, contact the nearest ranger station to see if the road you’ve in mind is open to bikes and safe for your family (there may be wildfires, logging or impassable washouts). Ask about current conditions, good parking and if you need a parking permit such as a Northwest Forest Pass. On BLM lands you may need a National Parks and Federal Recreational Lands Pass. 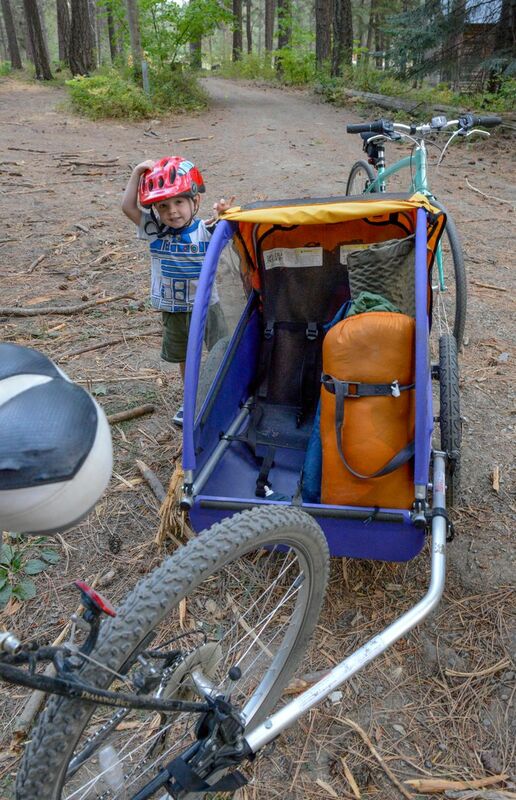 Bikepacking with families is on the soft end of the spectrum. To see what the hard-core version looks like, check out bikepacker.com. Chelan County resident Jeff Layton writes about overseas travels and outdoor adventures on his blog MarriedToAdventure.com.